Everything not UBC related... enter at your own risk! The tiny British enclave of Gibralter consists of a precipitous rock on Spain’s South coast (used as a military base) and a very small patch of flat land near the Spanish border. This little piece of turf serves as the site for the airport who’s runway cannot fit its plot and juts off into the ocean. 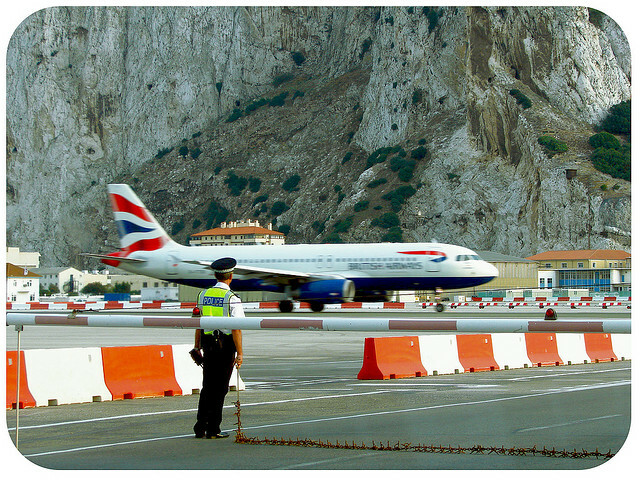 The runway also forms an intersection with Gibraltar’s only exit road, meaning that when a plane lands, cars have to stop at the traffic light to let it pass before continuing on their way! Kinda puts our little stop-and-look-both-ways at the pad into perspective eh?